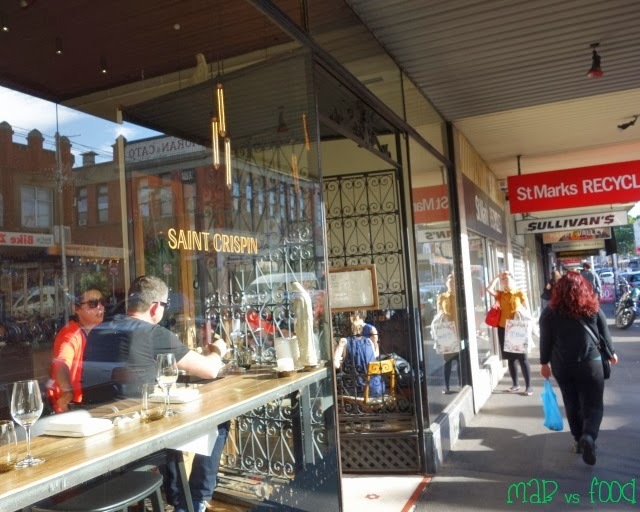 Saint Crispin has been very high up on my wishlist of Melbourne eateries for months, pretty much since it first opened and received glowing review after glowing review. It has not taken very long for Saint Crispin to develop a huge following and widespread recognition, opening only in July this year. It was awarded a chef's hat and the Best New Restaurant from The Age Good Food Guide 2014 only weeks after opening its doors. The men behind St Crispin are Scott Picket of Estelle and Joe Grbac, former head chef of Press Club. Both worked under Phil Howard at the 2-Michelin starred The Square in London. The restaurant is set in what was originally a cobbler's workshop. It is a very cool space with timber floorboards, high ceilings and tables with no tablecloths, which creates a relaxed, casual dining experience. There is also an open kitchen so diners can watch the chef's prepare their food, something that I am always intrigued by. 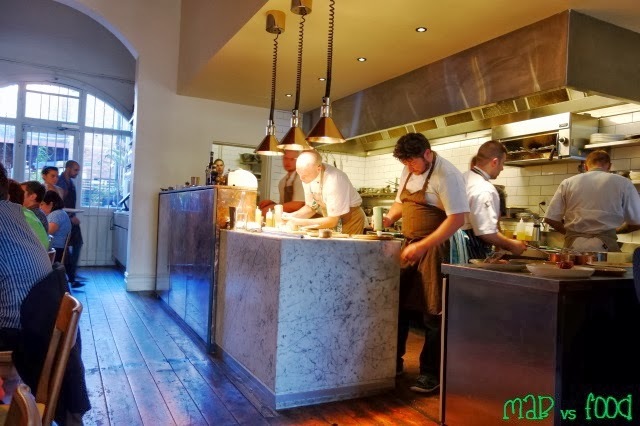 The menu at Saint Crispin has a strong focus on seasonal and mainly local produce. For the quality of the ingredients and the cooking at Saint Crispin, the menu is great value. You can either choose 2 courses for $50, 3 courses for $60, or go all-out with the 7-course chef's tasting menu at $120. There are also some snacks and sides on the menu. My wife and I decided to go with 3 courses tonight. Our waitress brought over a couple of snacks while we waited for our first courses to be served. 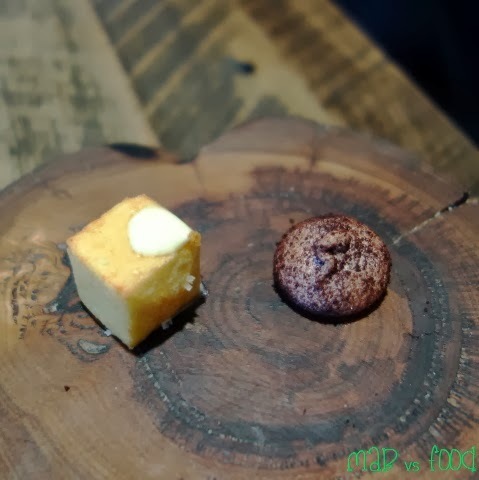 There was a a little chickpea puff that reminded me of a fried tofu puff in appearance and texture. This was served with a little dabble of lime mayo, which just delicious: zingy and zesty. The other snack was a sour hibiscus marshmallow coated in cocoa. The marshmallow was like a little cloud that evaporates in the mouth. 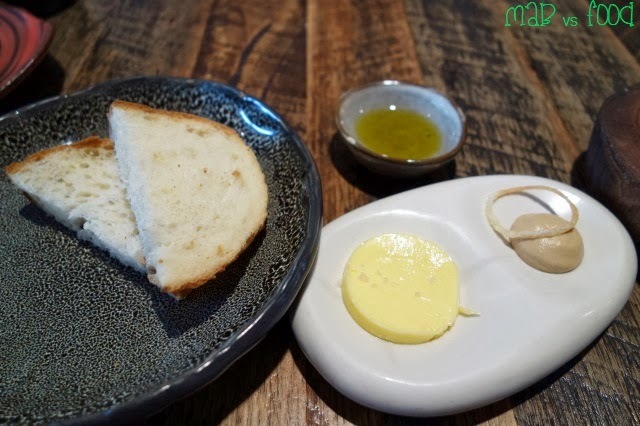 We were also served some sourdough bread, house churned butter, onion cream cheese and olive oil (because the waitress had mistaken my wife as a vegan). The onion cream cheese was just gorgeous and you can really taste the wonderful flavours of caramelised onions. Pity there was not more it as both my wife and I were fighting over it. There were also some premium courses on the menu tonight for those feeling indulgent, namely us. Our eyes lit up when we saw the words ALBA WHITE TRUFFLE printed on the menu! We knew we could only order one of the truffle entree (as it would set us back an extra $40)! I decided to also get the other premium entree on the menu, King Island Marron for an extra $12. Truffle is the one ingredient that gets me the most excited. I just love how that wonderful, pungent aroma of truffle fills a room. Ever since my Europe trip, my appreciation for truffle of the white variety has grown stronger. It may look much uglier than its black cousin, but the white truffle has a stronger, more pungent flavour and aroma than its black counterpart. White truffles from Alba (in Northern Italy) are a very prized ingredient and people pay big money to get their hands on these tubers (they can fetch USD 2,000 a pound for the best variety at auctions)! La Pergola (a 3-Michelin star restaurant in Rome) charges 98 euro with Alba white truffle, so $40 is a relative bargain(?) (although La Pergola sources the highest quality truffles). OK, so my wife was the lucky one on this occasion and got the white truffle dish for entree (but I still got to try some :D). Scott Picket, the executive chef, personally came over to shave the truffles over this dish (since no one else in the kitchen is allowed to handle this prized ingredient haha). It goes without saying, that this course was just amazing! The combination of truffles and mushrooms in a rich, creamy dish is just to die for. So satisfying, with each bite leaving you want to dig your spoon in for more! 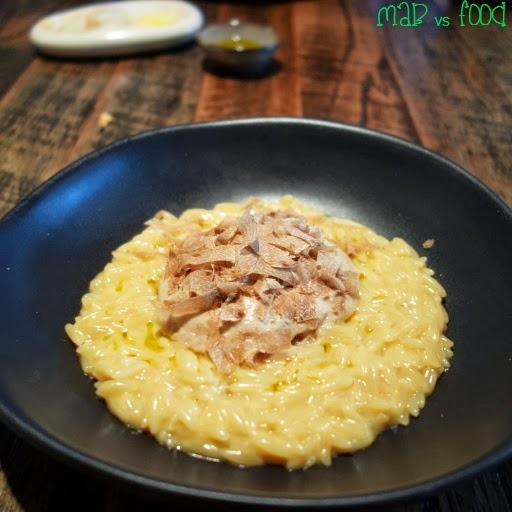 The risoni were like soft, slippery pellets that resemble risotto in appearance only. We would have preferred this dish as a risotto but the flavours of this dish still shine through! My marron course was also a highly enjoyable course that contained some beautiful flavour combinations. The marron was fresh, and very well cooked. 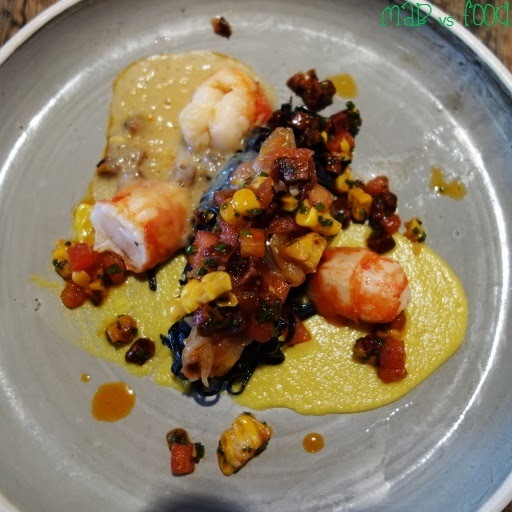 The flavours of the marron were paried nicely with sweet corn puree and grilled sweet corn kernels, diced tomatoes and bits of crispy, spicy chorizo. The contrast between the chorizo and the marron was amazing and complementary! This course was also served with some smooth and slippery strands of squid ink pasta. 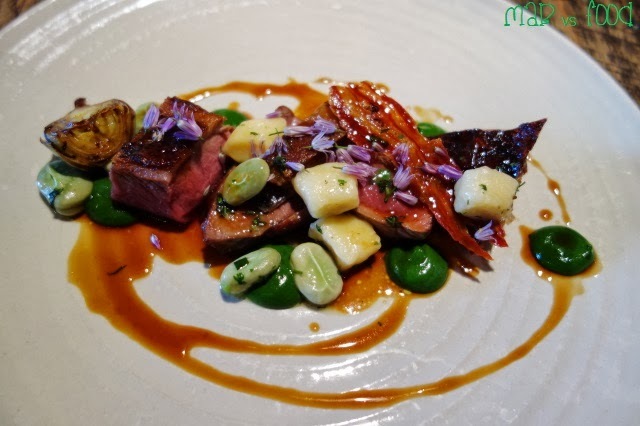 For main, I went for the Flinders Island lamb, which was served four ways. There was a braised shoulder, loin, a piece of leg and a rib. Each of these were a winner and beautifully cooked, but my favourite was the rib with wonderful caramelised meat falling off the bone. The dish also came with a thin, glistening strip of crispy bacon, a great addition for its texture and bursts of salty, porky flavour. Sharing the plate too was an intense, grassy nettle puree, cute little fluffy pillows of herb gnocchi, broad beans and lemony artichokes. My wife's main was the courgette flower, which was stuffed with goat's cheese. 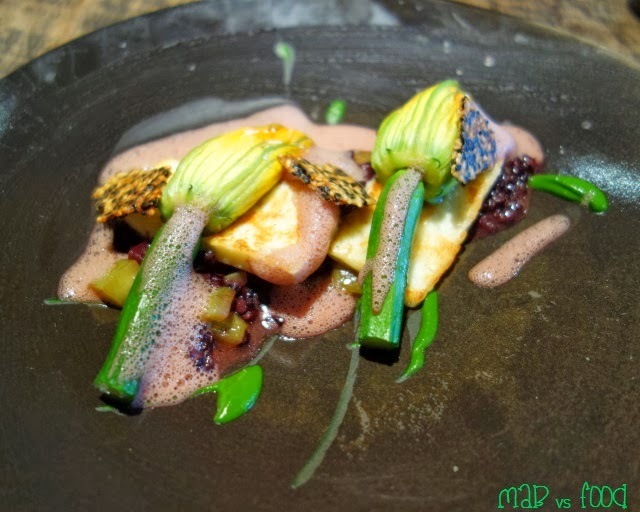 The dish was served with grilled haloumi, eggplant, red rice, a crispy sesame cracker, beetroot, nettle puree and an emulsion made from fromage blanc. There were some nice flavour combinations and textures here but even my wife found that this dish was too "cheesy" (which is saying a lot given my wife loves cheese). 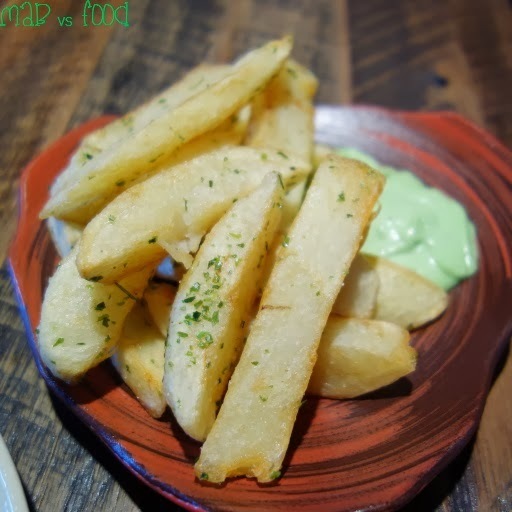 For some unknown reason, my wife always orders a side of chips when she sees them at menus of hatted restaurants... sigh. Perhaps she was a seagull in her past life? The sebago potato crisps were nice and fluffy and the seaweed mayonaise was very tasty and full of umami. 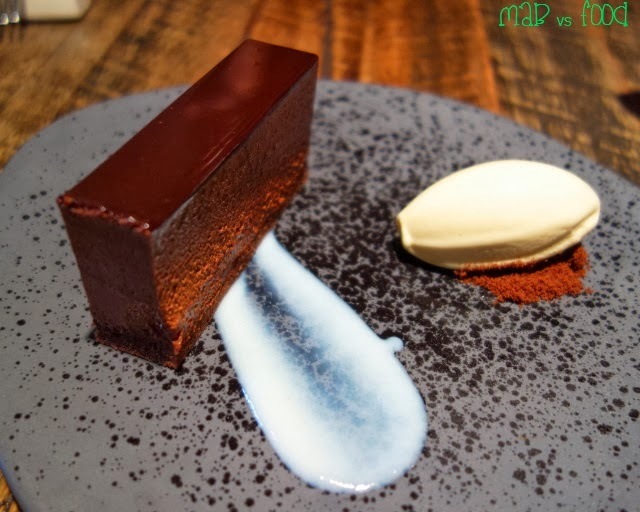 The chocolate dessert was just amazing, no other way of putting it. The chocolate mousse was smooth, airy and yummy. The thin ganache layer was rich and decadent. And there was a nice thin chocolate crust layer at the base. And the earl grey ice cream was very pleasant with a hit of that lovely floral bergamot flavour. The other dessert was a vanilla panna cotta served in a jar. The panna cotta was loaded with little black specks of vanilla and was quite rich and creamy, and not gelatinous, which I liked. 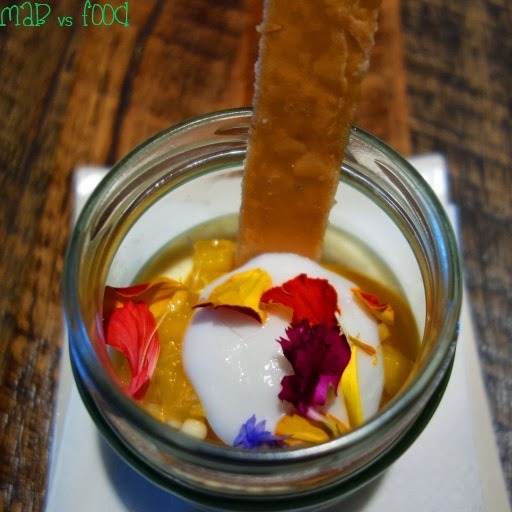 The panna cotta was topped with a dollop of coconut cream, mango and lemon verbena. 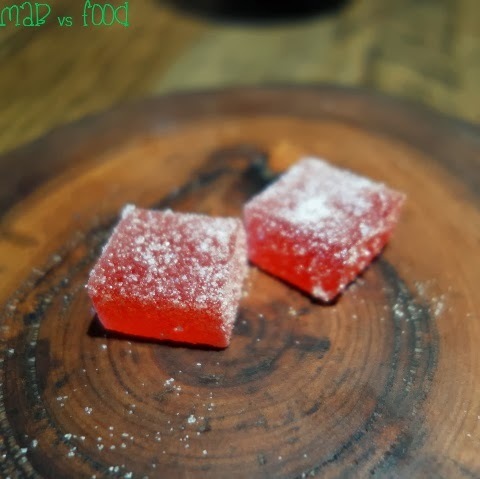 To finish off a fantastic meal, we had these blood orange jubes, which were quite sour but nicely balanced with a sprinkling of sugar. 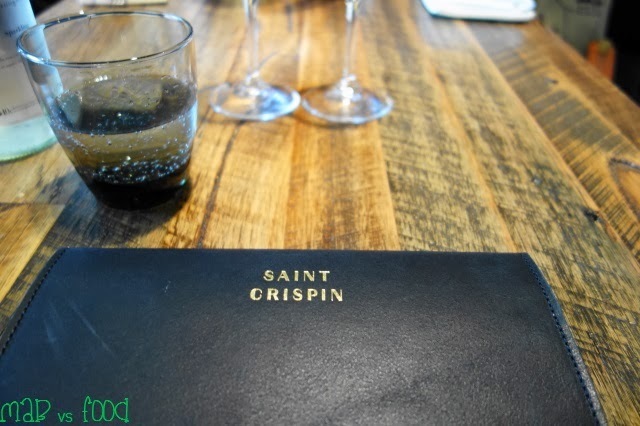 Our meal at Saint Crispin was brilliant and I can't wait to go back there again when I am in Melbourne next. I love the concept here: amazing cooking using fresh seasonal, mostly seasonal ingredients that doesn't break the bank. The ambience of the dining room is relaxed too and the meal won't take hours to finish. Sydney could do with a few places like Saint Crispin. I can't think of too many places in Sydney where you can have a 3-course meal this good for $60. 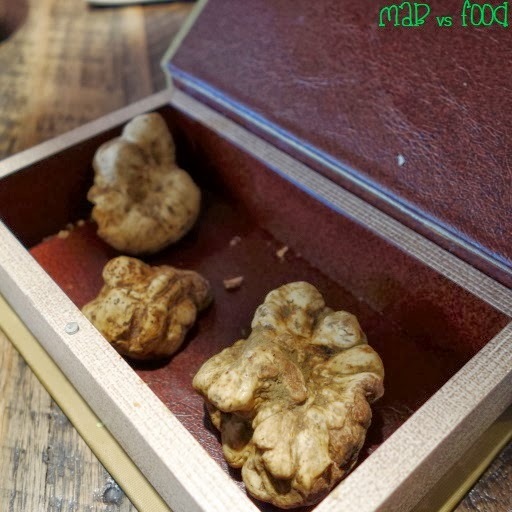 Highlight: WHITE TRUFFLE from ALBA! Lowlight: St Crispin is always busy so best to book early. And it can get loud inside, so it can be difficult to hear what your dining partner is saying.